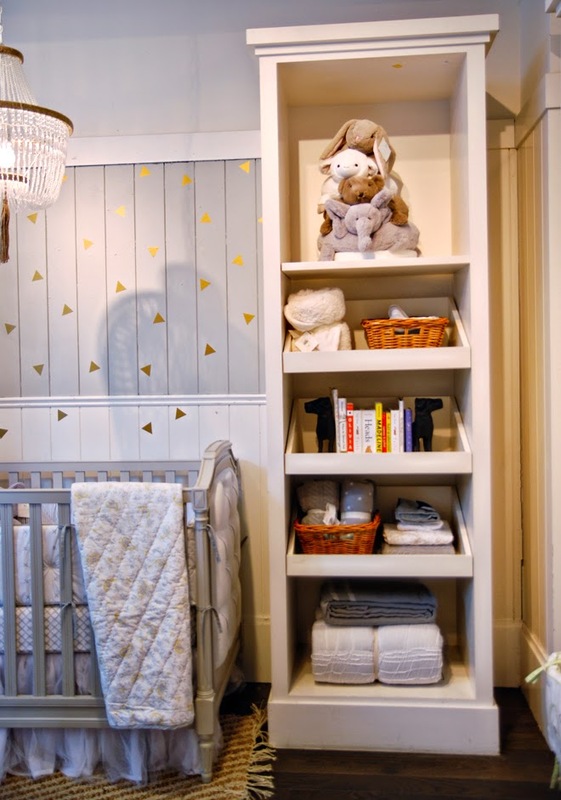 A few days ago, I had the chance to design my dream nursery at Pottery Barn Kids. 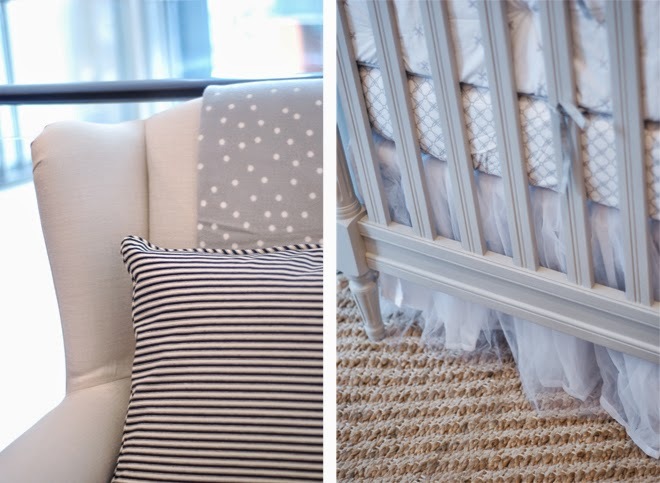 I hosted the Nursery Event at the Toronto store and was invited to shop the store and design a vignette. Now that's my idea of fun! 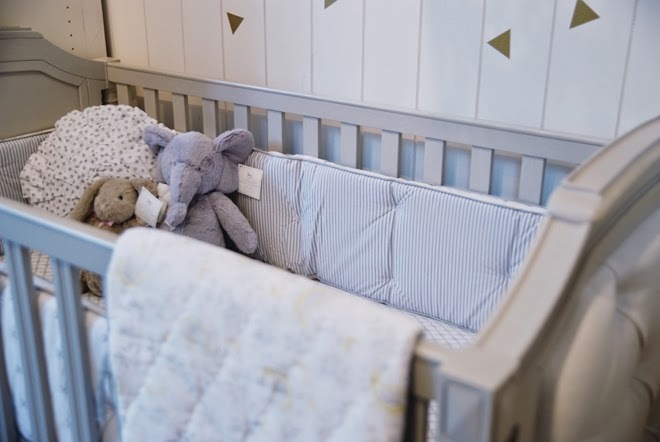 It's been five years since I designed Chloe's nursery so it was interesting to find out what's new in nursery decor and see what I would do differently. The first thing that struck me were how versatile some of the products were. 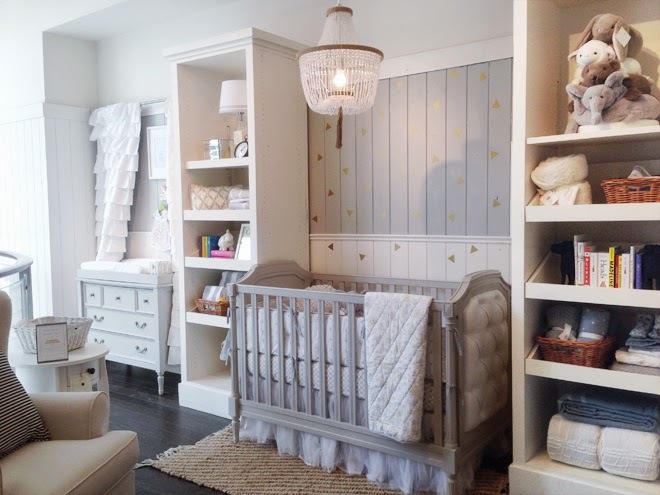 PBK offers furnishings in a beautiful soft grey that don't scream nursery. 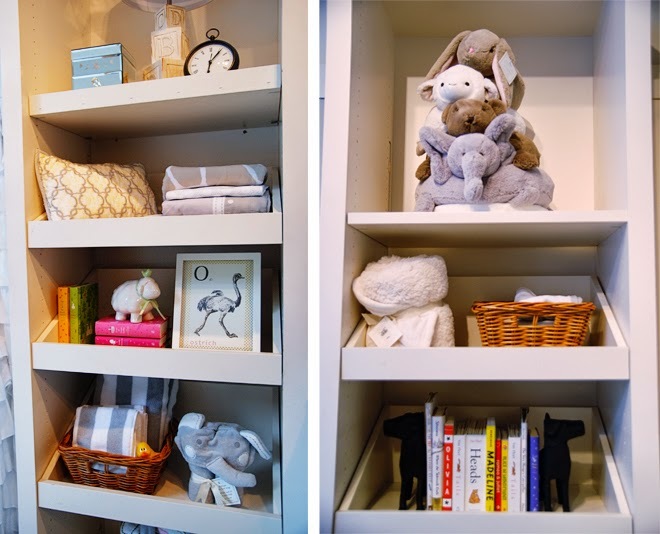 Items like this dresser could easily transition from changing table to entryway console down the road. I also fell in love with their lighting. I'm seriously considering getting this chandelier for the guest bedroom/Chloe's old nursery. The mix of crystal and twine is so interesting and its a good size for a bedroom. 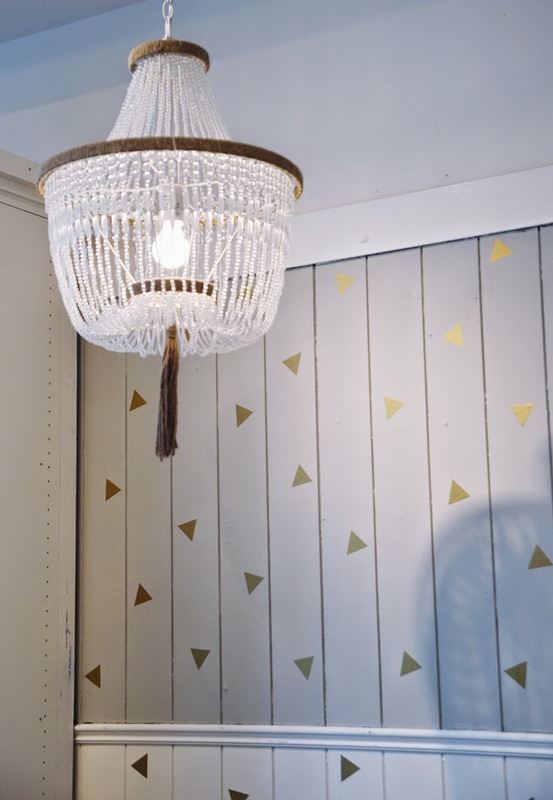 To bring in more of that golden hue, I added mini triangle decals from Urban Walls. Aren't they adorable? I think decals are so fun in kids' rooms and they're easy to change up if you tire of them. It was really fun to style the space. I created a few DIY touches, like framing book pages and alphabet cards as art. I added polka dot washi tape around the prints just to bring a bit more of that gold in. Using Chloe's baby dress (wasn't she just wearing that yesterday??) as decor was another personalized touch. And how often do you get the chance to play stylist in a store? I decided to do more "lifestyle styling" and decorated the shelves like they were in my home by mixing and matching products. I even popped downstairs to the Pottery Barn store and borrowed a few products like the dog bookends, the desk clock on the top shelf, and the striped pillow on the chair. The hits of black ground the neutral scheme and make it feel a bit more adult-friendly. Speaking of adult-friendly, this convertible wingback rocker (you can get it with stationary or rocker feet) in Belgian linen would look perfectly at home in any living room. I've paired it with the Sisal Chenille Jute rug for more of that natural feel. I really enjoyed putting this look together. Only trouble is, now I want to redecorate a room in my home in this grey-white-gold-natural scheme! 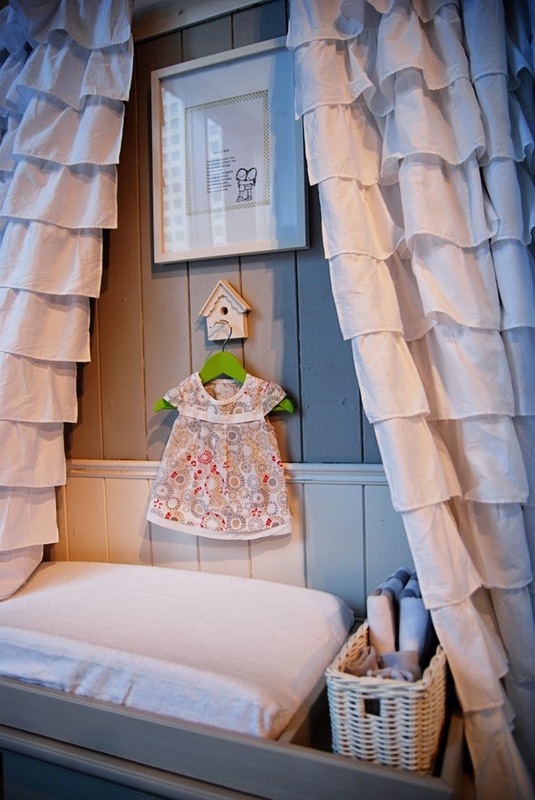 If you'd like to check out the vignette in person, it will be on display at the Pottery Barn Kids Bloor St. store until May 16th. Disclosure: I was compensated to appear at the Pottery Barn Kids Nursery Event but the opinions and ideas expressed in this post are entirely my own.